This section describes the steps involved in our registration process. As a first step, the new user submits a request for subscription. By submitting the request, the system sends the registration link to the user's email. Through this link the user will need to proceed to the second step of the registration and create an account. While on the WorkSpot homepage, click on the "Register" button. This button is located in the top right corner of the WorkSpot home screen (Picture 1). Once you have clicked on that button the "Register with The WorkSpot" window should appear. In this window, you will need to enter your name and your email address (Picture 3). After filling in both fields, click on the	"Get my Link" button. Please note that at the email field you need to define an email address that you are monitoring regularly. This email will be used for communications with	the WorkSpot and with the employers who publish vacancies on the platform. Upon successful completion of the action, a message should appear under the "Get my Link" button informing you that the registration link has been sent to your email. Also if there is an error with this process you should be able to see details of the error in the same location in the screen. WARNING: When the message of the successful email delivery appears, you should check your “inbox” for an email from the service. This email should contain the registration link as well as other information about the registration process. Below the registration link, the email should mention the time period (date and time) during which the registration link will be valid. You will need to make sure to complete your registration within this timeframe. If you have not received any email from us but your attempt to get a link was marked successful you will need to check your "spam" folder. If the registration email is marked as "spam" you should transfer it to the "inbox" folder and indicate that this email is not junk. As discussed, the registration link is active for a limited window in time. The registration process will need to be completed within this specified timeframe. To navigate to the Account Creation page you will need to click the registration link from your email or copy it to your browser. To register with the service you will need to fill in all the fields that appear on this screen. You may complete this form either in Greek or English with the exception of the email field and password field where you need to use latin characters. When defining a password make sure that your selection meets the minimum complexity requirements according to the instructions on the page. Also, make sure to type the same email address as the one that you have used to create the registration link. Once you have filled in all the required fields you need to confirm that you understand and agree to the terms and conditions that govern the use of WorkSpot and press the register button on the bottom left of the page. 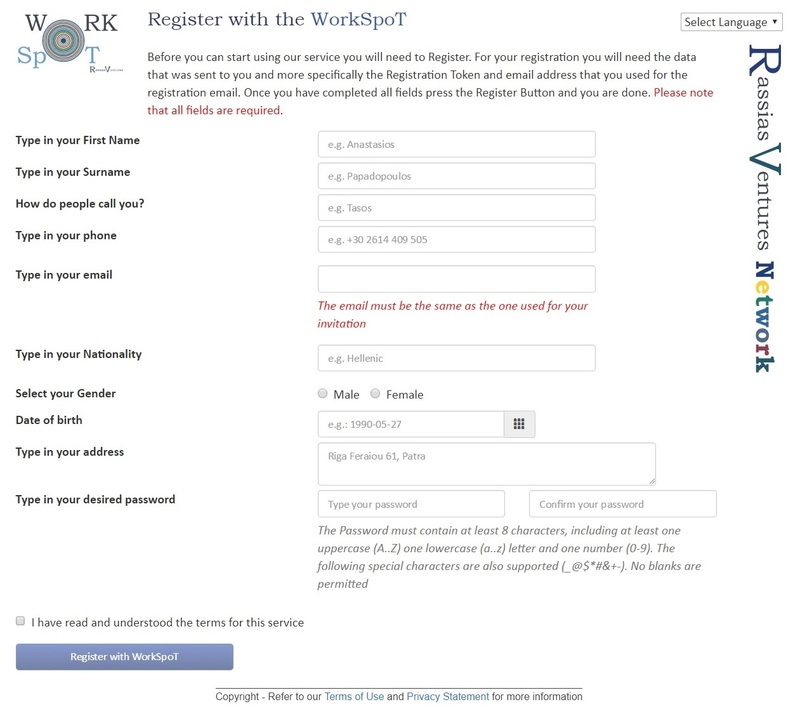 If any field includes wrong entries, then the frames of all the fields are blanketed in red colour, and an error message is displayed above the "Register with WorkSpot" button. Once this form has been successfully submitted a message should appear on your screen informing you of the succesful registration. Also you should receive an email confirming that you have registered with the WorkSpot (Remember to also check your spam).